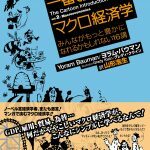 Cartoon Macro now available in Japan! Published by Diamond, available at Amazon Japan and elsewhere. PS. Here’s info about the micro book. And, courtesy of the publisher, here’s one of my comedy routines with Japanese subtitles! Below is a Jan 2012 video of a routine I performed at the American Economic Association humor session in Chicago. It contains bad language (repeated uses of the “s” word), so be forewarned.